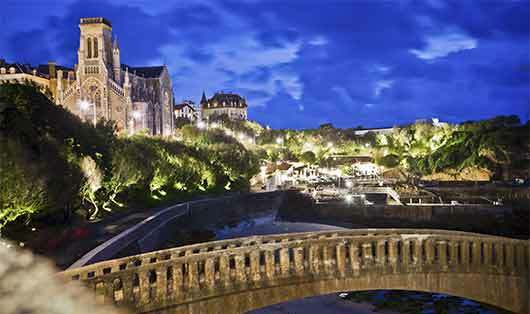 The up-market seaside resort of Biarritz is just 20 mins from the Suhiberry campsite. 20 minutes from the campsite Urrugne SUHIBERRY you can discover Biarritz, emblematic and luxurious seaside resort of the Basque Coast on which floats a rich perfume of an aristocratic past provided. While Biarritz was first a whale-fishing port, as evidenced by its famous “Port Vieux”, the town experienced an economic boom in the 19th century. Napoleon III and the Empress Eugenie make it their holiday resort. 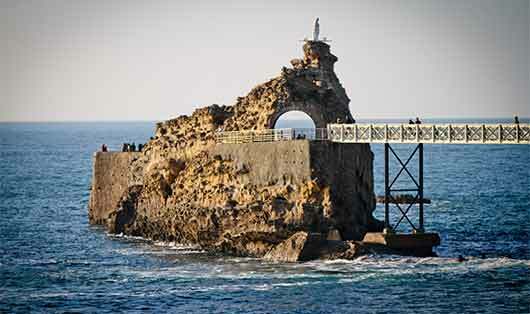 This is how Biarritz becomes the seaside resort frequented by the entire European aristocracy. The first golf course in Biarritz, the Golf du Phare and the first hyppic contests are the legacy of the rich English. These activities continue and today still the economy remains focused on tourism with luxury hotels, personal care (Thalasso) and water sports with scuba diving and the advent of surfing. 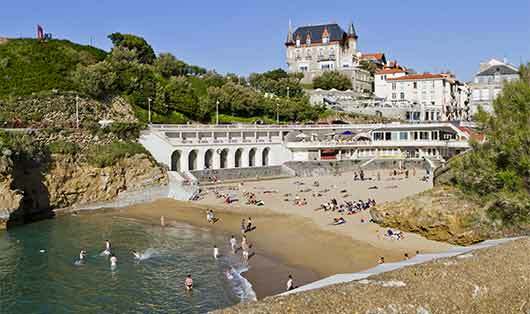 Biarritz in the Basque Country attracts you with its Grande Plage stretching from the Hotel du Palais to the Grand Casino. The sight of the ocean and its powerful waves breaking on the beach of the “Côte des Basques” or the mythical “Rocher de la Vierge”, delight all local walkers or tourists. The Musée de la Mer and the Cité de l’Océan with their huge aquariums show you the ocean in all its forms. This icon of the Côte Basque has a atmosphere redolent of its busy aristocratic past. Originally a whaling port – traces of which can be seen in the famous ‘Port Vieux’ – the area experienced an economic boom in the 19th century. Napoleon III and the Empress Eugénie made it their holiday destination. 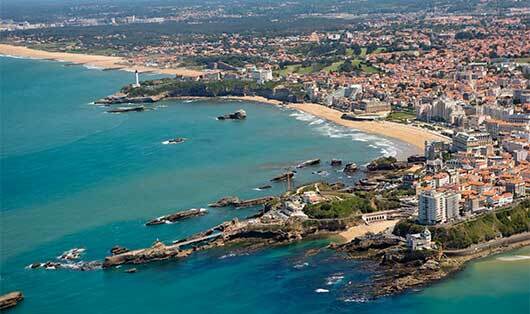 And Biarritz became the favourite seaside resort of all of Europe’s aristocracy. The first golf course in Biarritz, Le Golf du Phare, and the horse races are the legacy of wealthy English visitors. The Grande Plage, which stretches from the Hotel du Palais to the Grand Casino, is sure to draw you to Biarritz in the Pays Basque.